Happy 40th Birthday To Japan’s Favourite Cat – Hello Kitty! 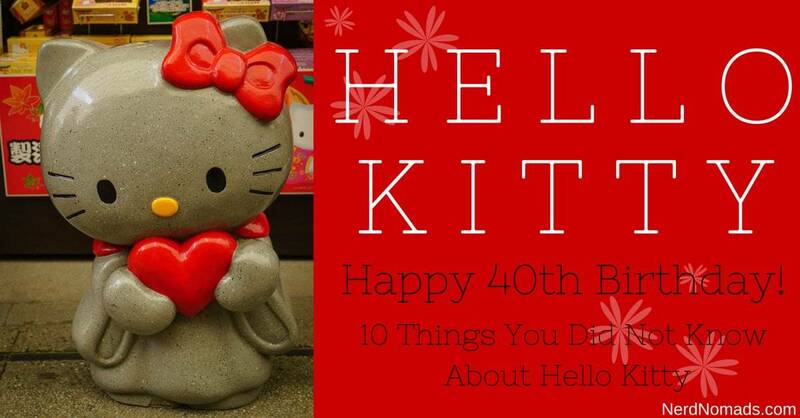 The world`s favorite bobtail cat Hello Kitty has reached the BIG 40! Can you believe it?! All around the world, and especially in Japan, there are Hello Kitty celebrations with events like hugathon where you get the chance to hug a life-sized version of Hello Kitty. Several brands are launching Hello Kitty themed products like Mitsubishi`s Mirage Hello Kitty edition pink vehicle, Bandai`s Chogokin Transformer Hello Kitty Robot, and the pearl and diamond Mikimoto x Hello Kitty jewelry collection. Also, Eva Air has Hello Kitty-themed airplanes that fly between Paris and Taipei to celebrate the big birthday, with food decorated as Hello Kitty. Would love to fly with that cute airplane! 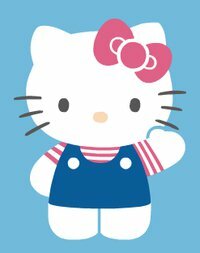 Hello Kitty was produced by the Japanese company Sanrio, created by Yuko Shimizu and currently designed by Yuko Yamaguchi. She is a Japanese bobtail cat with a red bow. She first appeared on a vinyl coin purse in Japan in 1974 that was brought to the United States in 1976. Hello Kitty soon became a big part of the Japanese popular culture and featured on a lot of products like clothes, shoes, accessories, toys, mobile covers, guitars, laptops, wine etc. 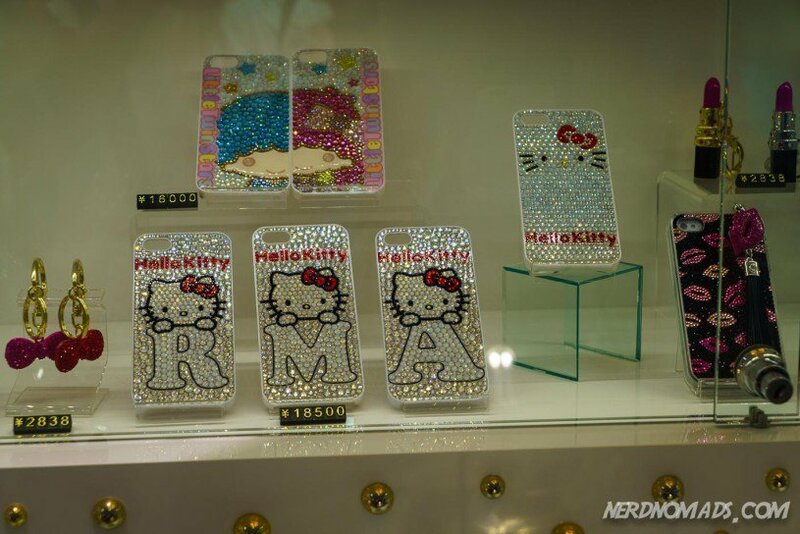 New series with Hello Kitty in different themed designs are released regularly, following current trends. 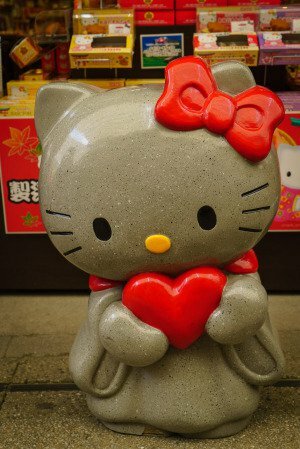 By 2014, when Hello Kitty turned 40 years old, she was worth incredibly $7 billion a year, all without any advertising! Unbelievable! Hello Kitty is also the main character at the two Japanese Sanrio theme parks, Harmonyland and the indoor Sanrio Puroland. Hello Kitty and Mimmy celebrated their 40th anniversary on 1st of November 2014. The “ARIGATO EVERYONE!” Birthday Celebration was taking place at Sanrio Puroland in Tokyo for several days. Hope you had an awesome party Hello Kitty! In 1990 the Sanrio Puroland Theme Park opened in Tokyo, where Hello Kitty is a big part of the park. The park has around 1,5 million visitors each year. They also have theme rides with other Japanese pop characters like My Melody, Cinnamoroll, and Jewelpet. It sure is the cutest theme park ever! You can watch three live shows and there is also a film theater in the park, and you can, of course, eat a lot of candy! Heaven! 🙂 Along Tokyo Disneyland and Tokyo DisneySea, the Sanrio Puroland is among Japans most popular theme parks, and well worth a visit! How to get there: Take the train: Odakyu Tama Line to Odakyu Tama Center Station, or the Keio Sagamihara Line to Keio Tama Center Station. From there take the Tama City Monorail to Tama Center Station. 1. Her real name is Kitty White. 2. She is five apples in height and three apples in weight. 3. She has a twin sister called Mimmy. While Hello Kitty wears a red bow on her left ear, Mimmy wears a yellow one on the right ear. 4. She has been the US children`s ambassador for UNICEF since 1983. 5. Her first love was Dear Daniel. He is portrayed as fashionable and sensitive, good at dancing and playing the piano, with an interest in photography, and dreams of being a celebrity. He is also a globetrotter and often away from home, and there are rumors that Hello Kitty is having an affair with Tippy the Bear….hmmm. 6. She promotes every thinkable product, except alcohol and cigarettes. 7. She was born in the suburbs of London on November 1st, 1974. 8. She has two pets; a cat and a hamster. Charmmy Kitty is a white Persian cat and wears a necklace that holds the key to Hello Kitty’s jewelry box. Her hamster Sugar was a gift from Dear Daniel. 9. She is good at baking cookies and loves Mama’s homemade apple pie. 10. She likes to collect cute things and her favorite subjects in school are English, music, and art. Hello Kitty is huge in Japan, and we saw her everywhere, especially in big cities like Tokyo and Kyoto. She is also very popular in the rest of Asia, especially Taiwan and South Korea. In Taipei in Taiwan, they have a Hello Kitty themed restaurant named “Hello Kitty Sweets” where it`s decor and many of its dishes are patterned after the Hello Kitty character. 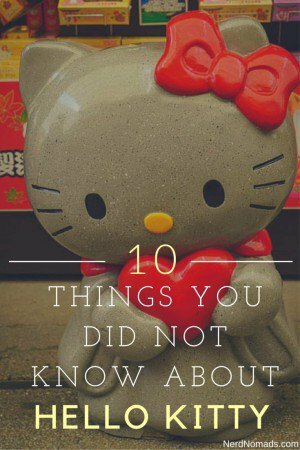 They also have a Hello Kitty-themed maternity hospital in Yuanlin, Taiwan, where Hello Kitty is featured on blankets, room decor, bed linens, birth certificate covers, and nurses’ uniforms. The hospital’s owner explained that he hoped that the theme would help ease the stress of childbirth. In South Korea, they have Hello Kitty Cafes several places in the country. I think the whole Hello Kitty concept is fascinating, and I am quite impressed by how the company behind her has managed to make her so big all across the world without spending any money on marketing. She is a big part of the whole “cuteness” rebellion trend of Japan which goes back to the 70s. While the USA and Europe had hippies, Japan had cuteness where young people did not want to grow up and step into the serious adult world with long working days. So instead they dressed up in childish clothes with cute hairstyles as a rebellion against the grown-up society. The Maid Cafes in Tokyo are inspired by Hello Kitty and her cuteness. Check out what else you should do in Tokyo in our recommended Tokyo Itinerary. Wow, I can’t believe Hello Kitty is 40 years old. I only really first came across it about a decade ago. Saying that I even saw a Hello kitty cafe a couple of weeks ago! Yeah I know, I could hardly believe it myself, that she is 40 years old. I would love to visit a Hello Kitty cafe! Love this! I can’t believe she’s turned 40 already either– and she’s still as popular as ever! It`s amazing how popular she is all over the world! And it`s fascinating that she has become so popular without the company behind her spending any money on marketing. Interesting. Actually, I was surprised how little I knew about Hello Kitty. I knew very little about her too actually, hehe. I was so fascinated by how popular she is in Japan. So I had to do a lot of research and find out more about her and why she has become so big all over the world. 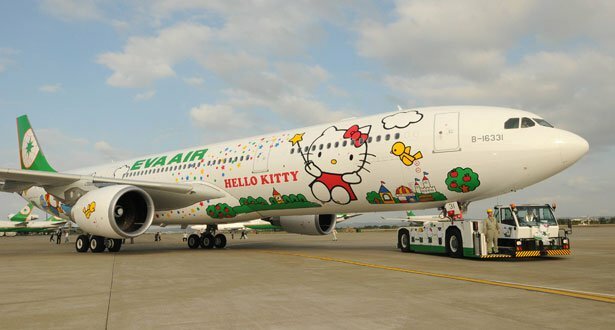 Oh how cute is that Hello Kitty plane – I want to fly on that so bad – cannot believe it’s 40yrs thats amazing. Ah, me too Laura! That Hello Kitty plane looks awesome! I am tempted to book a flight on it…..
Never new she was born in London! Always thought she was Japanese. You`re welcome! 🙂 I find the whole Hello Kitty concept and story quite interesting. 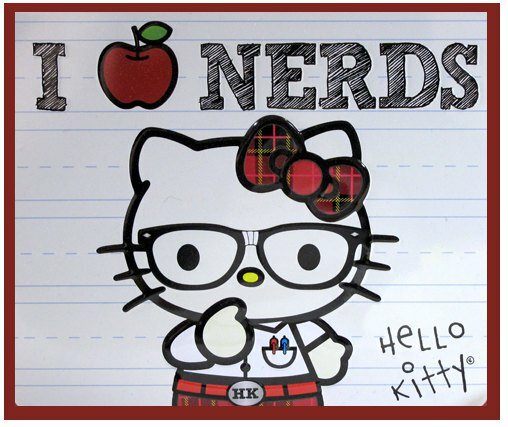 I grew up with Hello Kitty, so I loved this! The child in me wishes I could hop on the Eva Airlines plane right now. 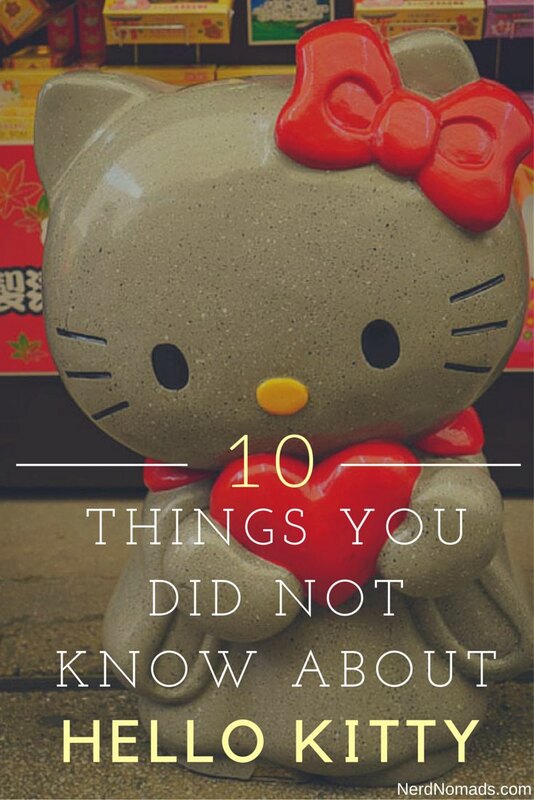 I remember reading earlier this year there was some article that came out saying the Hello Kitty wasn’t actually a cat and I think it upset a lot of people:) Did you come across that article that in your research? Ah, me too Emiko, I sooooo want to fly with the Hello Kity airplane! Looks amazing! 😀 The Hello Kitty themed food looks really cute. I read that article, very interesting, especially to read how people reacted to it. I had a Hello Kitty bank as a girl in the mid-70’s. Must’ve been one of the first. Wish I still had it. Now I feel as if I’ve been ‘in’ on a secret since the beginning.